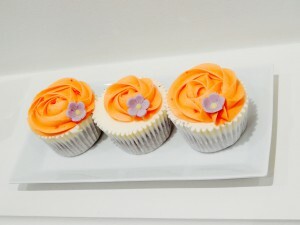 With the sun and the hot weather upon us, why not enjoy a cupcake that is not only delicious but also mighty refreshing? In a clean, dry bowl add the butter and beat continuously for 5 minutes. Once the colour changes from yellow to white, add in the golden caster sugar and beat again until light and fluffy. Add in the eggs and mix well (don’t be concerned if the mixture begins to split, it will come back together again a little later). In a separate bowl add in the flour, baking powder and salt and mix with a spoon. Now, add your dry flour mixture to the sugar and egg mixture and beat until fully combined. Add in the orange zest and orange blossom water and mix again. Now, spoon your batter into the cupcake liners until they are 2/3 full and place in the oven to bake for 15-20mins or until they are golden brown and spring back to the touch. Once they are ready, remove them from the oven and leave to stand in the cupcake baking tray for 5 minutes. After this 5mins is up, remove them from the tray and leave them to stand on a wire cooling until completely cold. Whilst cooling, using a toothpick, go round each cupcake and prick holes into the cake (NOT THE LINER), this will allow the syrup to penetrate the entire cake, making it moist and juicy. Using a Pyrex jug or dish add the caster sugar and hot water and stir with a spoon until the sugar has completely dissolved. Now, add in the orange juice and orange blossom water and mix again. Using a baking brush or an egg white brush, dip the brush into the syrup and brush it over the cupcakes. Make sure not to drown the cakes. Put enough on them so that it gets absorbed and looks wet. If you put too much syrup on the cakes, they will break down and most likely fall apart into a pile of sticky, sweet goo. Leave them to stand again whilst making the butter cream. In a clean, dry bowl add the butter at room temperature and beat continuously until the colour changes from a yellow to a cream colour. Now, using a spoon and some elbow grease, add in the icing sugar. You DO NOT want to use an electric mixer at this point as the icing sugar will end up all over you and not in the butter cream icing. Believe me, I’ve done it many times! Once all the icing sugar has been incorporated with the butter, add in the orange blossom water and then the milk, mix again until the butter cream reaches the correct consistency. 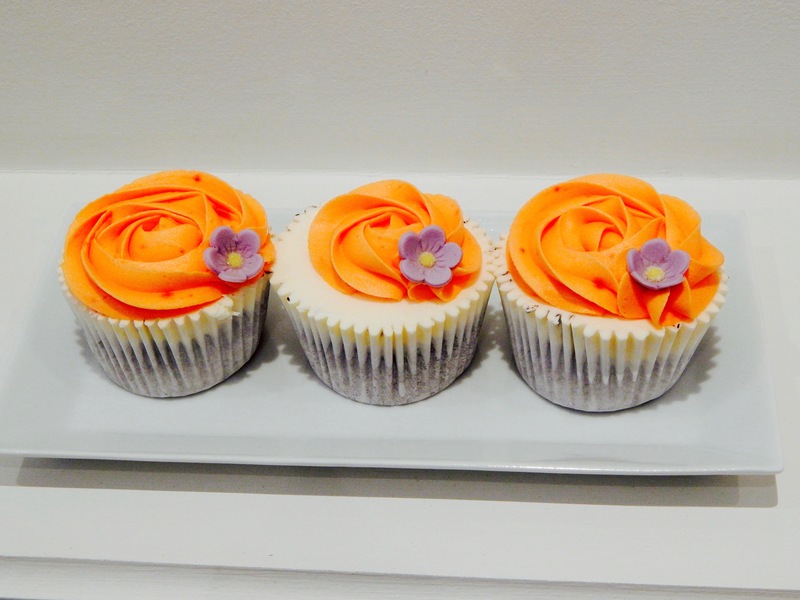 Pipe onto your delicious orangey cupcakes and serve! There you have it! 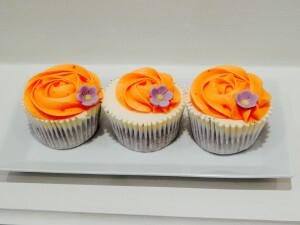 My refreshingly good Orange Blossom Cupcakes with Orange Blossom Butter Cream! Hope you’ve enjoyed this recipe and don’t forget to share it!